I hereby propose bookmakers adopt what I call the RHiD line, pronounced rid, which considers runs, hits and defense to create a point spread. First, we need a new system to create power ratings for each team. In football the difference between two teams’ power ratings is the baseline for creating a point spread. I’m suggesting bookmakers build an MLB version based on this formula: Per-game average of a team’s runs and hits minus the hits and runs it allows. The number created is now big enough to build a spread. As in football, though, that would be just a starting point for bookmakers. This is where their handicapping comes into play, as they adjust the spread for factors such as starting pitcher, location, injuries, slumps, bullpen strength, etc. And how do you bet on it? Well, you’re looking at the difference in the total number of runs and hits accrued in the game. 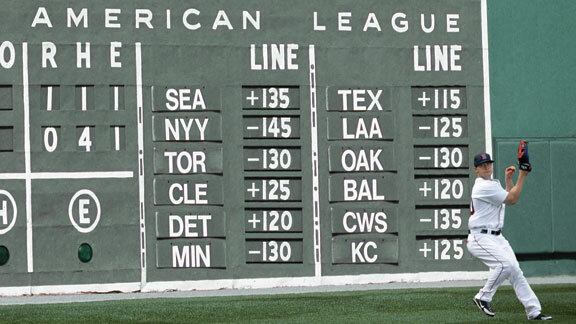 His argument is that the +240 and the -285 that we see next to MLB team names is too confusing for squares, so adopting some sort of a point spread like football would increase interest. (Instead of seeing Yankees -275, we might see Yankees -8.5.) He also believes that awarding points for hits would keep bettors interested into the later innings. The game might be lost, but that doesn’t mean that the trailing team can’t rally to cover the spread.